Lewis Goldstein (Luigi Enrico Pietra d’Oro), Author. "Laugh out loud and pause to ponder." The Columbia Review. 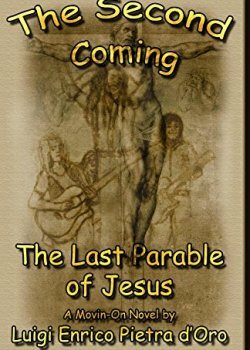 Sharply irreverent and laugh-out-loud funny, “The Second Coming, The Last Parable of Jesus” tackles conventional Christianity like an eager bull in a china store filled with sacred cows. But oddly enough, this novel presents a worthwhile message, an intriguing approach to an age-old question: What would Jesus do? And what better way to pose radical propositions and make readers think (rather than close their minds) than through a good story filled with humor? While this is a comedic novel, the story is no less intense and full of action than a good page-turner. Author Lewis Goldstein (a.k.a. Luigi Enrico Pietra d’Oro) clearly has done his research. The novel is populated by all the New Testament main characters with whom every Christian would find both familiarity and shock, as their literary embodiments here are the stuff of cringe-worthy revelation. In this contemporary Californian reincarnation, Jesus, his family, his apostles and his opponents are hilariously cast with brilliance and irony. God himself, who appears to enjoy playing dress-up, sports a long beard and flowing robes, inspired by the Godly portrait Michelangelo painted in the Sistine Chapel. And why not? Surely the Divine would possess a divine sense of humor, wouldn’t He? Jesus in this “Second Coming” is Hispanic (as white people do not named their boys ‘Jesus’), and God sends him back for reasons very different from what mainstream Christianity and peripheral evangelicals believe. But the reasons (without spoiling the many surprises) are no less virtuous — yet unlikely to be embraced by the End of Days aficionados. What we find especially worthy of praise in this highly creative work, beside the familiar yet endearing cast of holy characters, is the truly original take on what is the real difference between good and evil, and what it really means to have faith in the goodness of mankind and its Creator. More specifically, what is the nature of the responsibility to live a life of virtue. And while dogmatic theologians might take offense, “The Second Coming” will surely make the reader laugh out loud, pause to ponder those big existential questions (beyond religious dogma) and in general become a better person — even a better Christian. Highly recommended!